President Trump decided to celebrate Independence Day a day early by setting off fireworks of his own!! Maxine Waters, the outspoken darling of the left was once again called out by President Trump in a tweet Tuesday morning in which he mentioned her being "one of the most corrupt people in politics", and warned that her recent "ranting and raving" would cause supporters to "flee" the Democratic party altogether. How corrupt is Maxine Waters?? Throughout her 27 years in Congress, she’s rated the most corrupt member in Congress by the Citizens for Responsibility and Ethics in Washington, for not just one year, but also for the years 2005, 2006, 2009, and 2011. Since being elected in 1990, only three of the bills she’s sponsored have become law- a Haiti relief bill, a modification of the national flood insurance program, and the renaming of a post office. According to Washington Free Beacon, America hating Maxine Waters is as corrupt as they come (without being charged). With 90% Democrats in her district and assured to be in the top two for General Election, she spends $56,000 for slate cards. The usual amount for slate cards is under $20,000, and that’s on the high end. This money, donated by her supporters wasn’t used for the election, it was transferred to her daughter, Karen Waters. So, to not appear to be a campaign payment. Mailers sent out to more than 200,000 people in South Central Los Angeles contain an "official sample ballot" with quotes from Waters on candidates or causes she supports. In exchange for placement on the mailers, her campaign committee receives a donation. The most expensive slate cards are usually around ten cents each--for the very best cards. She’s sent out 200,000--so that should be about $20,000. If the payoff to her daughter is $36,000, you do the math. Charges for a spot on the ballot range widely between $171,000 for an affluent California businessman running for elected office, to tens of thousands of dollars for candidates like former Gov. Gray Davis, to $250 for a school board candidate, according to the CREW Beyond Delay Report. Of the $1.7 million collected by L.A. Vote over the past eight years, mainly from the slate mailers, approximately $450,000 has gone to Karen Waters and her consulting firm, Progressive Connections, and $115,000 to Rep. Waters’ son, Edward. Karen Waters also collected $20,000 from a small non-profit that she established with her mother called African American Committee 2000 & Beyond. Donations to the non-profit stem from organizations and corporations seeking to win Waters’ favor. The money collected from donations made to the non-profit have been used to pay for numerous parties hosted by Rep. Maxine Waters at the Democratic national conventions. One of the largest sponsors of the convention parties is Fannie Mae, a company who’s been cited for manipulating earnings in the past and accounting misconduct as well. Read the full House Ethics Committee’s statement here. Payments to Citizens for Waters range from $2000 to $12,000 this past cycle and have come from a tiny percentage of California judicial candidates. From the seven committees, Water’s campaign has collected $56,000 shown by official filings. Karen, Maxine’s daughter, has collected over $750,000 in "professional fees" from the campaign since first given the go-ahead by the Federal Election Commission (FEC). Several prominent California politicians have paid to be on Waters’ mailer in the past, including none other than Sen. Kamala Harris, who in total had paid $63,000 to Maxine’s campaign and appeared on the mailers on two separate occasions. Harris first appeared on the mailers on May 5, 2010, when she was a district attorney in San Francisco and ran for attorney general. Harris for AG 2010, Kamala’s committee, made three payments to the Waters campaign throughout the cycle, totalling $33,000. Harris next appearance on the slate mailers came in 2016 when she ran for the U.S. Senate. This time, Harris’s committee, Kamala Harris for Senate, paid $30,000 to appear on the slate mailers. In 2010, while seeking his current position, Gavin Newsom, current Democratic lieutenant governor of California, (who is again running for governor), paid Waters campaign $45,000 for his "share" of slate mailer. Waters began running the operation through the state committee L.A. Vote, but after asking the FEC to issue an advisory opinion on whether or not she could run it through her federal committee in 2004 (which the commission allowed), this changed. Although the practice of using slate mailers is common in Oregon, California and other states, it is unique to Maxine Waters on the federal level. She appears as the only politician running it from their federal committee, according to search results for payments on the FEC’s website for "slate mailers". In 2005, the Citizens for Responsibility and Ethics in Washington (CREW) released a 93-page report entitled "Beyond Delay: The 13 Most Corrupt Members of Congress", in which it documented the most unethical and possibly illegal activities of Members of Congress. 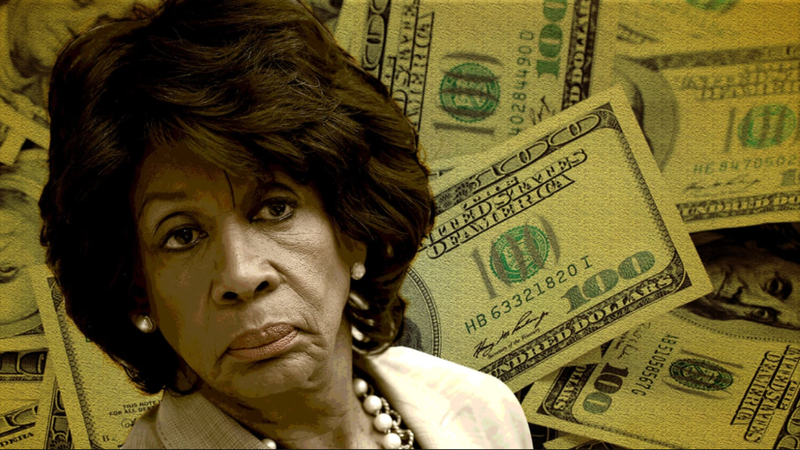 The report on Maxine Waters, specifically, states that "Her ethics issues stem from the exercise of this power to financially benefit her daughter, husband and son. Rep. Waters’ family has earned a total of more than $1 million in the last eight years through business dealings with companies and issue organizations Rep. Waters has assisted." Karen Waters is not the only family member of Maxine Waters who has benefited. Her husband, Sidney Williams works as a part-time consultant for a bond underwriting firm. Siebert, Brandford, & Shank--despite having no background whatsoever in the bond business prior to his work as a consultant for the company, he collected close to $500,000 by making valuable connections between politicians who have received Water’s support and Siebert, Brandford, & Shank. He was able to capitalize on her connections to close many lucrative business deals for Siebert, since government bond deals are awarded based on negotiations, he racked up. As an example, when Waters guaranteed a $10 million loan from the Department of Housing and Urban Development to school board members in Inglewood, ( a city within her district), an underwriting firm was necessary to handle the $40 million school bond sale. Guess who they chose? You got it, Siebert. From this one transaction, Sidney Williams earned $54,000 in commission. Waters’ husband is also a stockholder and former director of OneUnited Bank where the executives were major contributors to her campaigns. Waters arranged meetings between U.S. Treasury Department officials and OneUnited Bank so the bank could plead for federal cash. The bank was heavily invested in Freddie Mac and Fannie Mae but when the U.S. government took them over, their capital was "all but wiped out". The bank received $12 million in Troubled Asset Relief Program (TARP) money and the matter was later investigated by the House Ethics Committee who charged her with violations of the House’s ethics rules in 2010. After almost three years of investigation, Waters was cleared on all ethics charges. When a 20-year lease to run the county-owned Chester Washington Golf Course in South Los Angeles was won by Maxine’s husband, Sidney Williams and her son Edward Waters, they reaped earnings between $140,000 and $400,000. The County Supervisor Yvonne Brathwaite Burke, (the district where the golf course was located) was endorsed by Rep. Waters just a few months prior, establishing a win for County Supervisor. In January 2008, the Citizens for Responsibility and Ethics in Washington wrote to the Committee on House Administration requesting that grandchildren be added to the list of relatives members of Congress are prohibited from employing which can be read in its entirety here. Despite all of the rampant corruption, Maxine Waters has been able to market herself as the champion for black Americans, even chairing the caucus from 1997-1998. Since her time as chair for the Congressional Black Caucus, the black poverty rate has remained stagnant. With Reps like Maxine Waters, Nancy Pelosi, and Chuck Schumer, the "face" of the Democrats is one covered with clown makeup. The only difference being that clowns actually put on a good show, where this is more like a train wreck---a long, misguided, pathetic trainwreck filled with lies and corruption. I guess in clown terms, they’d all have a frown and a tear painted on them. The Democratic party, in and of itself, is the proverbial joke with no punchline. Maxine’s ridiculous comments come a dime-a-dozen, with highlights that include telling everyone she is a "millennial" and when she claimed that the rioters attacking Koreatown during the L.A. riots were only "mothers who took this as an opportunity to take some milk, to take some bread, to take some shoes." She also apologized to Fidel Castro for opposing his regime and thanked him for protecting Assata Shakur, convicted murder. She also blamed the CIA for the crack epidemic. A good way to describe Maxine Waters would be "crazy", which is exactly the term the president used this morning when calling her out for her recent behavior. This is not the first time the president has mentioned Maxine Waters in a tweet, but this is the first time that he’s called her out for being corrupt. Maxine Waters has been back in the news recently, but for all the wrong reasons. Her outspoken and downright insulting rhetoric has not been received well by anyone, including the Democratic party that she represents. Her criticism and disgust for President Donald Trump had hit a dangerous level of "crazy" that many had no idea existed. Congresswoman Maxine Waters emerged after White House press secretary Sarah Huckabee Sanders and her family were asked to leave a Lexington, Va. restaurant, The Red Hen, strictly because of her position in the Trump administration. In response to the restaurant kicking Sanders out, Maxine Waters called for all members of the Trump administration to be heckled when seen out in public. "If you see anybody from that Cabinet in a restaurant, in a department store, at a gasoline station, you get out and you create a crowd and you push back on them, and you tell them they’re not welcome anymore, anywhere," Waters told a small group of supporters. Trump immediately fired back on Twitter writing that Waters is an "extremely low IQ person" and hinted that she may also be targeted in a similar fashion--"be careful what you wish for Max!" Independent journalist Laura Loomer wanted to ask Rep. Maxine Waters (D-Cal) about her recent comments and confronted her face to face. After identifying herself and her support of Trump, Loomer asked Waters several questions during the minute-long walk towards the elevator. "Where are conservatives allowed to go? Do we sit at the back of the bus? Where do conservatives eat at a restaurant in D.C.? ", Laura asked while Waters kept repeating the same thing over and over, "Please come to my office and sit down to talk with me...and be civil." The entire time, Waters is putting papers in Loomer’s face and hitting Loomer’s phone (that she used to document the confrontation on film), with the stack of papers, almost knocking it from her hand at one point. Watch Loomer confront Waters, here. The brief confrontation ended with Waters entering a "members only" elevator, surrounded by her team. One man repeatedly says "This is a members-only elevator. Members have to vote," which got louder and louder as the doors of the elevator shut and Maxine Waters, now at the very back of the elevator, surrounded by her team, can be seen smiling and sticking her tongue out like a child. Many people, including her own constituents, were appalled by her call to harass Trump officials. Senate Minority Leader Chuck Schumer, (D-N.Y.), even condemned her behavior during remarks on the Senate floor. "If you disagree with a politician, organize your fellow citizens to action, and vote them out of office, but no one should call for the harassment of political opponents, that’s not right, that’s not American," Schumer said. Maxine Waters’ disapproval of the 45th President of the United States, Donald J. Trump is not something she’s been shy about. "Impeach 45!!! Impeach 45!!!" is something you’ll hear from Waters any and every chance she gets, even leading a women's march with the ridiculous chant. Waters stood by her remarks and told reporters that she’d never called for violence or harassment of Trump administration officials, that she had simply asked her supporters to "peacefully" protest them if they were seen in public. "I believe in peaceful, very peaceful protests," Waters told reporters. "I have not called for the harm of anybody. This president has lied again when he’s saying I called for harm to anyone." The quote "Absolute power corrupts absolutely" sounds as if it was written just for Maxine Waters.